Larry and Lorrie Collins dressed in flashy Western wear. Their visually captivating performances were well-suited to television variety shows. NEW YORK — Lorrie Collins, one of the most dynamic female rockabilly stars of the 1950s, died Saturday at her home in Reno. She was 76. Her brother, Larry, with whom she performed and recorded as the Collins Kids, said the cause was complications from a fall. Ms. Collins was the winner of talent contests in her native Oklahoma when she was 8, and by the time she turned 12 she was appearing onstage with her brother, a guitar prodigy who sang high harmonies above her declamatory lead vocals. They dressed in flashy Western wear, and Larry, two years Lorrie’s junior, played a double-necked electric guitar and hopped around onstage. The duo’s visually captivating performances were well-suited to television variety shows. Preternaturally self-possessed, Lorrie Collins was also highly photogenic — a factor that, coupled with the novelty of the siblings’ youth, earned them regular invitations to appear on shows starring household names such as Jackie Gleason and Dinah Shore. For the most part, though, the Collins Kids were well received by television audiences. The same could not be said of their experience with radio; country and pop stations alike proved indifferent — perhaps because of a lack of promotion by their label, Columbia Records — to the frenetic songs, like “Hop, Skip and Jump” and “Hoy Hoy,” that they recorded between 1955 and 1962. Nevertheless, thanks to rockabilly aficionados in the United States and overseas, as well as their influence on the music of neorockabilly and punk bands such as the Stray Cats and X, the Collins Kids’ catalog has remained in print or been reissued, just as their hyperkinetic early TV performances have been preserved on YouTube. Lawrencine May Collins was born on May 7, 1942, in Tahlequah, Okla., in the foothills of the Ozark Mountains, to Lawrence and Hazel Juanita (Robinson) Collins. Her father was a dairy farmer and later worked as a crane operator in a steel mill. Her mother was an amateur singer and mandolin player who became her children’s de facto manager once their musical gifts became apparent. Ms. Collins’s first victory at a talent contest came at a show hosted by guitarist Leon McAuliffe, formerly of Bob Wills and His Texas Playboys, at the Tulsa Ballroom in 1950. McAuliffe was also the one who urged Ms. Collins’s parents to leave Oklahoma to pursue a musical future for their children in California. They moved to Long Beach in 1953. 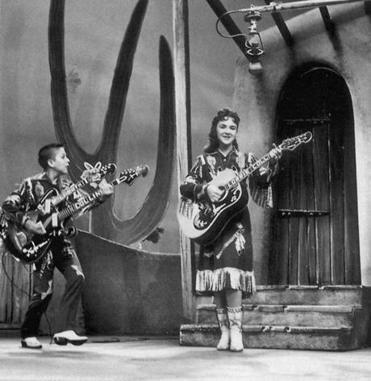 The siblings auditioned for “Town Hall Party” in February 1954 and found themselves performing as members of the show’s cast the next evening. Her brother pursued a career as a songwriter. He had his greatest success as the writer, with Alexander Harvey, of “Delta Dawn,” a Top 10 country hit for Tanya Tucker in 1972 and a No. 1 pop single for Helen Reddy in 1973. The Collins Kids reunited for a performance at a rockabilly festival in England in 1993, after which they continued to perform until Ms. Collins’s death. In addition to her brother, Ms. Collins leaves two sisters, Nicki Jean Collins Marmelzat and Sherry Madden; two daughters, Christy Hall and Lynn Mullins; and four grandchildren. Former child performers such as the Collins Kids often have difficulty, after their early flush of fame, adjusting to ordinary life. But in a 2007 interview he and his sister did with The Washington Post, Larry Collins insisted that they were anything but recovering adolescent stars.